Have you been to the SCPCUG web site (http://www.scpcug.com) recently? If not you have missed out on all the additions. I have added five new pages. In the Menu under Business you will find our Articles of Incorporation. See when we were incorporated and who was on the initial Board of Directors. If you go to the Space Coast PC Journal page and click on "Current Journal Preview" you will go to the Table of Contents (TOC) page. Click on the new "Web Master Wanderings" link in the TOC and you will be reading my current article online, complete with all the referenced links ready to click on. Back to the Main Menu. Under Links you will find three more new pages: General Information, Year 2000 (Y2K), and Member Home Pages. Be sure to check the General Information page for virus and net hoax info sites. There is also a great link for the Web Novice. If you are worried about the Y2K problem our Year 2000 page will send you off in the proper direction. Member Home Pages has thumbnail pictures and links to member sites. Why not add your site? Send me your URL (Uniform Resource Location) address. In addition I have added to the Hardware and Software Links pages a number of new sites for you to visit. Read a review on the Pentium III 500 MHz processor or find the site for Windows Device Drivers. It's tax time again! Need a free program to do your Federal Income Tax Return? If you missed it in Bob Click's "From the Deals Guy***" column last month here it is again. The final version of TaxAct '98 is now available free at http://www.taxact.com/. This is no small program! It's a 4.3 MB download that expands to 14.5 MB. TaxAct '98 is a very polished and classy program that uses a familiar looking Internet browser type interface. This interface makes it very easy to maneuver throughout the program. You can choose to go through a question and answer interview or just go directly to the over 80 forms, schedules, and worksheets to start filling in the blanks. The only drawback will be for those of you that use Quicken or Microsoft Money. TaxAct '98 does not allow for importing of data files from any program other than itself. Last time we discussed ICQ (I Seek You) available at http://www.icq.com/. If you now have ICQ installed I have a great add-on program. It's called MagicSpell and is available at http://www.2bsys.com/MagicSpell/index.htm. MagicSpell is also available from the ZDNet Software Library (http://www.zdnet.com/swlib/). Do a search for "MagicSpell". 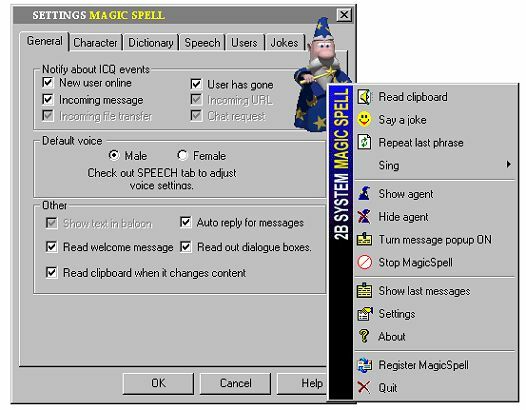 MagicSpell is a Text-To-Speech program for ICQ. When activated Merlin the wizard (a Microsoft Agent character) pops up, greets you by name and welcomes you by giving a quote of the day. Merlin can also sing two songs and has a vast array of jokes (many of which are very funny) that he loves to tell. So what does this have to do with ICQ? Well everytime you get a message on ICQ Merlin reads it to you so you don't have to. There are a number of check boxes on the Settings General tab which allow several other options. You can have Merlin read you Windows 95 dialog boxes but that includes Internet cookies which can get a little tiresome. But the best part is Merlin will read anything copied to the clipboard. The Internet is a vast storehouse of information but you have to read all that information. Not any longer! Sit back, kick your feet up on the desk, close your eyes and relax while Merlin reads it to you. So what does Merlin sound like? Is it one of those monotone robot type voices your ears easily get tired of hearing? The answer is no. MagicSpell initially has 8 adult male and 2 adult female voices (Lernout & Hauspie TruVoices). 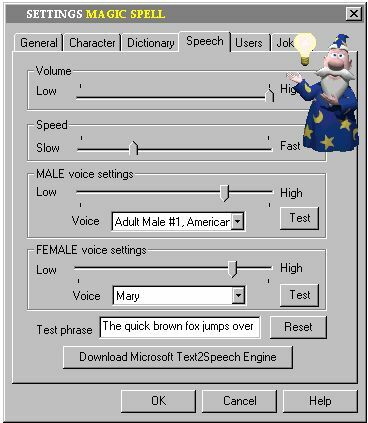 I am using adult male #1 for Merlin and cranked up the pitch level to 75% on the Settings Speech tab. This is a subjective type thing and you will just have to experiment as to what is most pleasing to your ears. As I mentioned in a previous column I use the IBM Simply Speaking Gold Voice Recognition program for navigation. Simply Speaking Gold also comes with a Text-To-Speech module and several 2-D graphic characters that have their eyes blink and lips move when reading text. But what a difference a couple of years have made in the advancement of the technology. Merlin is a 3-D animated graphic with 68 normal animations (acknowledge, alert, announce, blink, confused, etc.) and 10 looping animations (reading, searching, thinking, etc.). And Merlin's voice is much more human in quality. In addition to the expected normal voice inflections for say a question, comma, exclamation or period, Merlin seems to have a sense of sentence phrasing and briefly pauses at the proper spot even when there is no comma. I was very impressed. MagicSpell is still in beta test so it has a few areas grayed out in the Menu Settings tabs but otherwise works quite well. I must compliment 2B Systems as they have a Newsgroup (news://news.2bsys.com/MagicSpell) available for MagicSpell. They monitor this Newsgroup and provide answers to questions. It will give you additional insight as to what people think of the program, additional features wanted, and how problems can be solved. There is also a Download Help page (http://www.2bsys.com/MagicSpell/help.htm) and a Frequently Asked Questions page (http://www.2bsys.com/MagicSpell/faq.htm). Both are very informative. I urge you to read the Newsgroup, Help page, and FAQ page before downloading this program as it will give you a much better understanding of what to expect. The download file for MagicSpell is approximately 1 MB. But this is a bit misleading as the first thing it does when executed is connect to the Internet (if you are not already connected) and go to Microsoft's site to automatically download and install four additional files which take up about 10 MB. The four components are Microsoft Agent 2.0, Microsoft Agent Character (Merlin), Lernout & Hauspie TruVoice Text-To-Speech Engine with TruVoices, and Microsoft Speech Control Panel. During this auto install your computer may sit blank several times (like nothing is happening) for 30 seconds or more. Do not be tempted to cancel. Your computer will come back to life. You are not given an option as to where to install these four components. They are required in specific places on your C drive for MagicSpell to work properly. When the installation is complete MagicSpell will automatically start, but I thought it best to close the program after Merlin said hello, and reboot the computer. On reboot Windows 95 rebuilds your driver database. After you have played with MagicSpell for a while you will discover a button on the Speech tab in Settings. Here we go again! Click it and you are downloading the Microsoft Text-To-Speech Engine which will install another 12 MB on your C drive. This option will give you four more voices (Mary, Mike, Sam, and RobotSoft) with variations (17 total). I found Mary's voice to be quite natural sounding but it just did not fit with Merlin's image. Enter the next option. If you don't care for Merlin there are many more characters available for download that work with the Microsoft Agent. Checkout Microsoft Agent Character Gallery (http://www.msagentring.org/agentchars.html). Here you will find info on 22 of the most popular Agent Characters and links to where they can be downloaded. A few are Peedy the Parrot, Genie, Robby the Robot, Max the Dog, Oscar the Cat, Birdie, Electra, etc. 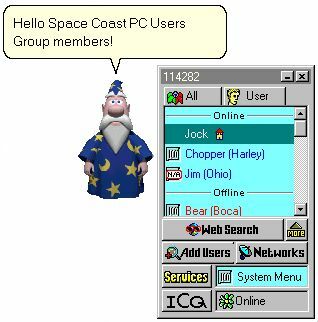 Do you get the idea this whole thing is bigger than just MagicSpell for ICQ? You're correct. This Microsoft Agent thing is a whole movement of program developers and people interested in characters that can talk and interact. If you want to get educated go to the Microsoft Agent Web Ring (http://www.webring.org/cgi-bin/webring?ring=agent;list) for a list of 94 sites. For Microsoft Agent Character Data go to http://www.microsoft.com/msagent/characterdata.asp. It has info on installing the characters and using them with Microsoft Agent 2.0. To find out more about Microsoft Agent 2.0 go to it's home at http://www.microsoft.com/workshop/imedia/agent/default.asp. Microsoft defines it's Agent as "a set of software services that supports the presentation of software agents as interactive personalities within the Microsoft Windows interface". So what if you do not have ICQ? Is there an alternative that will let you try out this Agent Interface? I'll give you two but I am sure there are more. I have not tried either of these programs so you are on your own. Both are available from the ZDNet Software Library (http://www.zdnet.com/swlib/). Do a search for "Talking Email" and "Speak & Mail". The home of Talking Email is http://www.4developers.com/util.htm#TE and the home of Speak & Mail is http://www.shadisoft.com/speak/index.html. Well I think that's it for this month. Now to have Merlin read me all this text back. Oh yes, I have found Merlin quite useful as a proof reader. He picks up things the spell checker misses like when the misspelled word is actually another word. Example: "trail" when you thought you typed "trial". NOTE: For an Updated Review "MagicSpell Revisited a Year Later: Review of the new Streambox MagicSpell" read the Feb 2000 Web Master Wanderings.